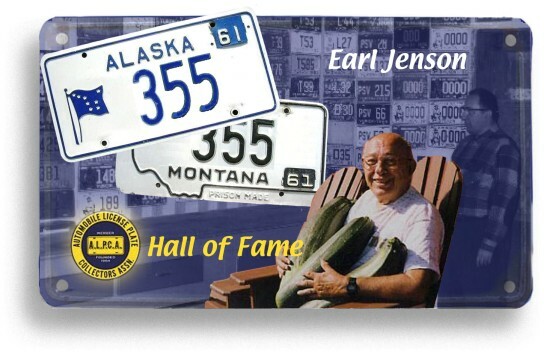 Earl Jenson was born in Deer Lodge, Montana November 11, 1926. A veteran of the Army Air Force from 1945 to 1948 he moved to Alaska in 1950 and went on to serve the state of Alaska for 25 years. He was the last surviving member of the Alaska Highway Patrol, which later became the Alaska State Troopers. He retired to his native Montana in 1978. Earl married Dorothy Bartholet in 1967 and they raised one son (Carl). Earl passed away July 21, 2008 in Polson, Montana. Earl joined ALPCA in 1961 and served as President from 1974 to 1975. He also served as Director. His great love was collecting and trading license plates. He made many great friends through this hobby and inspired hundreds of collectors to value the relationships over the materialism. He clearly was the first serious collector of Alaskan plates and many collections still show the number 355 written on the back of the tag. To follow are a few tributes from Earl's many friends and fellow collectors. An old timer who traded plates the old fashioned way on the point system. Earl kept a prized photo book, which was a who.s who of plate collectors that had visited him over the years in Alaska and Montana. No sad songs for Earl, he lived a full life and was a very positive person for the club. In the pioneer days of ALPCA the friends you made were just as important as the plates you found. Earl was my friend and he will not be forgotten when us oldsters gather around the campfire to swap stories of plates deals good and bad. A very generous member. Visits with Earl and meals by Dorothy will never be forgotten. He enjoyed the mountain vistas at his Montana home and loved to tell stories of his early days in Alaska and the lonely nights at the weigh station. When I was just getting started with what later became akplates.org, Earl generously answered a letter from a stranger (and then, also a non-member). He sent me some photos that really opened my eyes to plates other than the current ones on the road. Earl was a good guy and honest collector. He was the first plate collector I ever corresponded with long before I joined the club. For years of leadership and service we welcome Earl Jenson into the Hall of Fame.